This week the council released the results of a survey into the public’s priorities for the region and once again transport came out on top. The majority of Aucklanders say better public transport, less traffic congestion, and more affordable and quality housing are the top priorities for the region. The results are part of an annual survey measuring what Aucklanders want from their council and how they feel Auckland Council is performing. The annual survey is a valuable tool to help the council gauge the concerns and priorities of its residents, and to identify where the council needs to improve its services, activities and communication. The latest council-Colmar Brunton survey was concluded in September 2013 and measures a range of factors, including perception and attitudes towards council’s performance, and what Aucklanders want from their council. 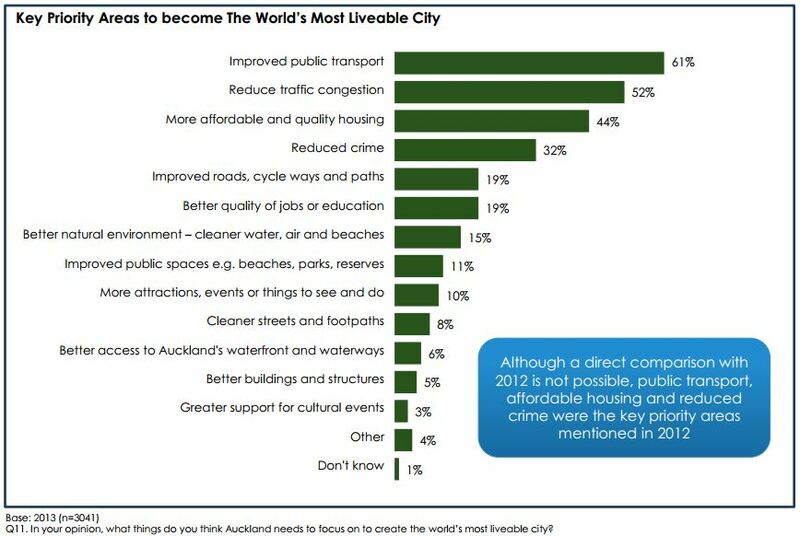 When asked what Auckland needed to focus on to become the world’s most liveable city, 61 per cent of respondents said improved public transport, 54 per cent said reduced traffic congestion, and 44 per cent said more affordable and quality housing. You can find the full results of the survey here. It took place last year and in total over 3000 people took part with a margin of error of 1.8%. One thing I’m not sure of is why the results took so long to be released. Here’s the full list of responses that gave the answers above. 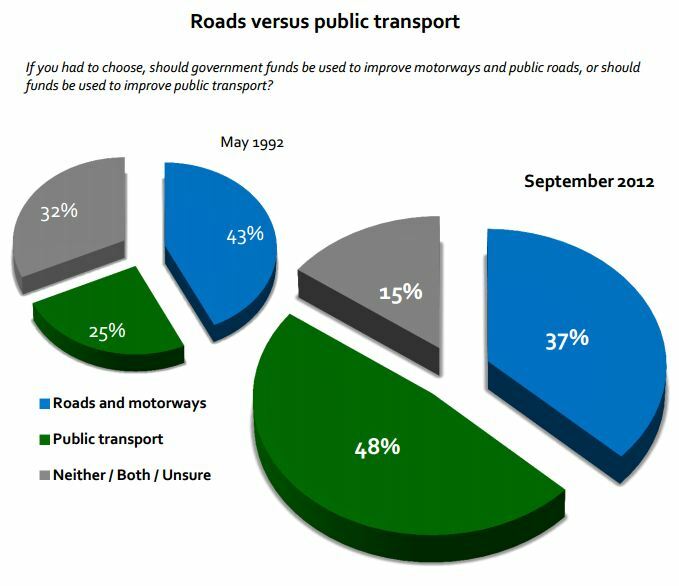 The top two answers are extremely similar which highlights the desire with which people want to see transport improved. Of course one of the advantages of investing in PT is that while it won’t reduce congestion directly (due to induced demand) it can reduce the number of people exposed to congestion as there are options to avoid it. Also earlier last year a UMR poll showed large support nationwide for better PT. Of course what we’re getting in funding is quite different with a huge amount of funding being poured into roading projects while PT projects struggle. On a separate note, also from the survey there was a number of questions related to the council’s sub brands. 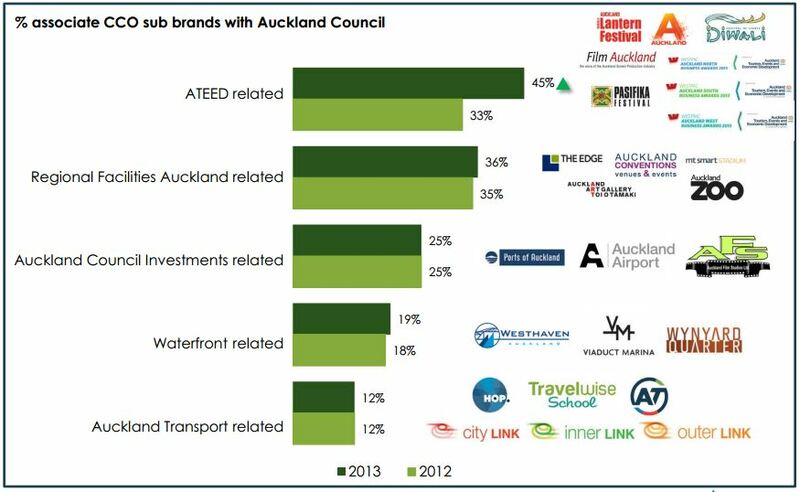 What surprised me was not so much the results but just how many sub brands the council has. Why do they need to. 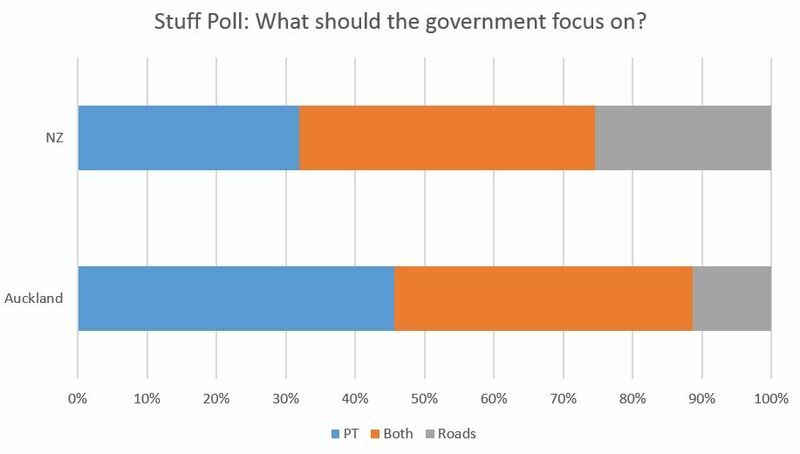 The public is already paying billions for the alternatives now, all the public are saying they want is the same $ spent differently on PT and non-road options. Exactly as per the CFN. Exactly, we collectively already pay plent of rates, income tax, GST, petrol tax etc, to fund billions worth of new infrastructure. Perhaps the question should ask more specifically “what should the government spend the existing transport development budget on”. And on the subject of PT, latest board report numbers for August show another massive month. https://at.govt.nz/about-us/our-role-organisation/meetings-minutes/ – Item 9 Monthly PT report. on the 12 months to Aug-2013. So who says no one uses the trains? Thats right, Councillors Quax, Brewer, Wood, and few others. Time to revist your prejudice perhaps folks? At 11.7m thats pretty close to exceeding Wellingtons annual train boardings 2 months into the new FY. Amazing how low better natural environment and better jobs fit in! Maybe Aucklanders are already happy with those. We have a great natural environment here, already better than just about any city in the worlds, and our job situation is robust and stable. I’m not surprised that transport and housing top the list, it’s the non-natural environment that we are poor stewards of! I think it also represents the public’s essential realism; they intuitively recognise that transport can be improved, that we have been doing it so badly for so long; that it’s fixable. Afterall we already spend so much to deliver so little (Apologies to Dolly Parton). Those increases in public transport figures are phenomenal. I am particularly surprised at the growth rate of the NEX service given that it has been a relatively good service for a while. My thoughts are that the simple improvement in creating a bus lane on Fanshawe street has dramatically improved the quality of the homeward journey. I wonder if these increases have meant that farebox recovery has improved and therefore a small reduction of another 25 in fares is warranted in the new year? Or maybe weekend fares are targeted to induce people to use public transport when they ordinarily might not? My understanding is that (some, many?) services on the Busway run close to 100% farebox recovery. Because of the efficiencies of scale that are made when a service gets real grade separation. Of course the efficiency of parts of the system is aided by less the less efficient sections too, the network effect, so this is a bit of an oversimplification. But it is absolute proff that the failure by NZTA and MoT and the gov to expand and complete a Rapid Transit network of all modes as their top transport priority in Auckland is, essentially, ‘economic vandalism’. Basically they are keeping the city poorer by only investing in amenity for drivers. “The Arras tunnel, which runs under the National War Memorial park has taken two years to construct and opened to the public for the first time today”. So there was money to fund this mindless tunnel and nothing for the CRL. Unbelievable! But hang on, the Arras tunnel is part of the holiday highway; first you get to the airport as quickly as you can on Friday afternoon and then you re-join the highway at Mangere (another tunnel proposed here) and you wind you way up to Omaha or wherever on another RoNS. And remember the Basin flyover is part of this trip that is of national significance. (I think national should have a capital N). So what is Len Brown’s Auckland Council doing? Planning to build hugely expensive roads, while cutting back on pools and libraries.